Downloads - Domestifluff : Food, Craft, Etc. 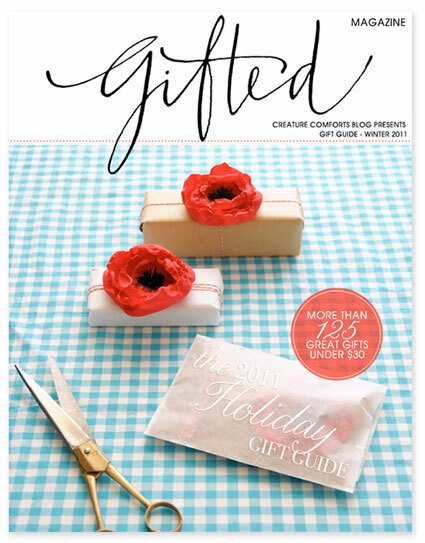 Have you seen the new issue of Gifted Magazine yet? Ez from Creature Comforts has put together this super duper fantastic collection of holiday gift ideas for pretty much anyone that you mind find on your gift list this year, and starting on page 130 you’ll find 8 pages of free printable holiday gift tag designs, including these “Mod”-Century gift tags that I designed exclusively for the magazine. Head on over to Gifted for plenty of great holiday gift ideas and to download all of the fun, printable gift tags, too! Last week on Paper Crave, I shared these fun paper citrus slice and box templates, and I wanted to let you all know about them, too. You can use the citrus slices for a bunch of different types of projects – everything from scrapbooking project embellishments to handmade cards to citrus-themed party details, and I’ve included SVG, GSD, DXF, and Silhouette Studio files (half slices and full slices) for those of you who have digital cutters, as well as a PDF with all of the files if you’ll be cutting the slices out by hand. Also included in the zip file are SVG, GSD, DXF, and PDF templates for the favor/gift box, and I created a Silhouette Studio template file that includes perforations. 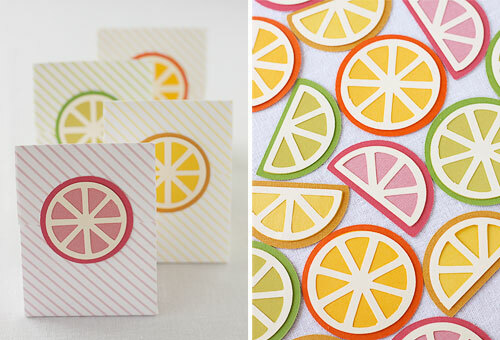 PDF files for the striped papers are included, too, so you can make your own striped, citrus slice embellished boxes. Please read : All files are for personal, non-commercial use only and are © Kristen Magee. You do not have permission to redistribute, resell, or claim any of these files as your own, and you may not use the citrus slices or boxes as elements in products that you will be selling. I have a little bonus for you to go along with the cinnamon dough ornament project that I posted last week. 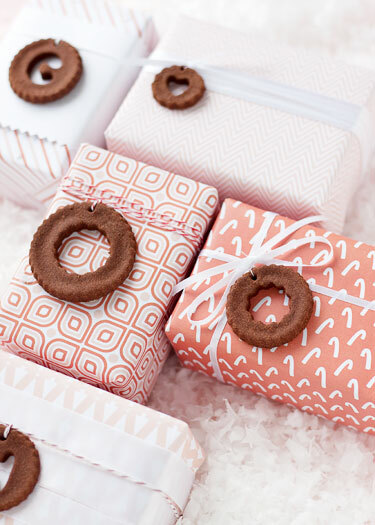 This year’s printable holiday gift tags in a pink colorway, plus matching printable patterned papers! Links to the printable files can be found below. You will need the Adobe Acrobat Reader to download and use these files. Download the reader for free here. These templates are for personal, non-commercial use only. I’ve been working on a pretty ambitious felt tree skirt project this year, and it’s left me with a bunch of leftover ivory felt, so I’ve been trying to come up with some small projects that make use of the felt leftovers. 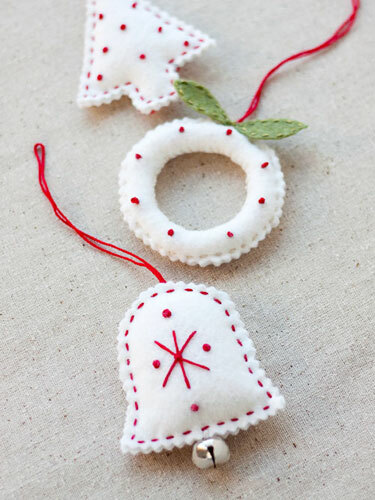 These little ornaments aren’t at all difficult to make, even for beginners at embroidery, and even though they make extensive use of the fancy (and intimidating, so I’ve read) French knot. Trust me, the French knot isn’t difficult at all once you get a few practice knots in, and here’s a a video that takes you through it in real time, so if you’re a visual learner like me you’ll be a French knot pro in no time and will want to use this stitch anywhere that you possibly can. I had so much fun designing this year’s set of printable holiday gift tags, but I have to admit that I had some trouble finalizing a color scheme because I had about ten different color palettes that I wanted to use. I wanted something sort of retro, subdued, but still festive, and I finally decided on a palette of candy apple red, icy teal blue, mint green, and silvery taupe. 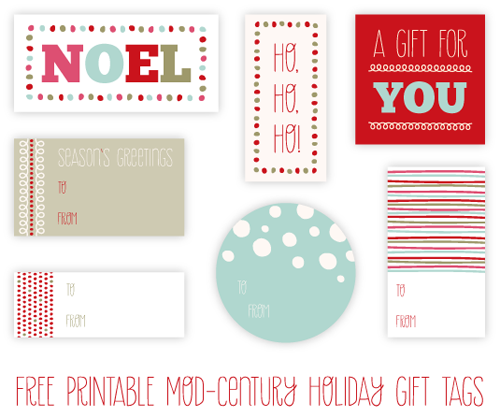 Download the free printable gift tags (161Kb PDF). If you’re looking for more holiday tags, please check out 2009’s wintry holiday gift tags and the colorful, patterned gift tags over at Paper Crave. You will need the Adobe Acrobat Reader to download and use this file. Download the reader for free here. These templates are for personal, non-commercial use only. This craft is part of the 13 Days of Halloween project. Download number templates for the project, as well as the bug template for Day 3, in the tips and supplies post. Links to all of the crafts from this project can be found in the main 13 Days of Halloween post. This is it, Day 13! 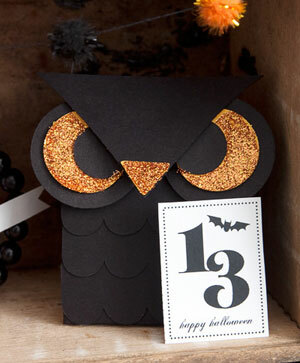 This little owl may look menacing, but he’ll be holding Halloween treats for you when you get to the big day. Happy Halloween! Quick Tip: If you’re pressed for time and want to speed up the process, you can cut 2″ wide x 3/4″ tall pieces of black cardstock and use decorative edging scissors (Fiskars Clouds and Scallop work very well for this) to make the feather ruffles, instead of cutting out the feather ruffle templates.